If you like electronics, computers and entertainment, you'll want a Best Buy gift card. Best Buy offers the latest and greatest technology products, in addition to an ever-growing selection of merchandise (including home and lifestyle) available exclusively at BestBuy.ca. But that's not all, Best Buy also delivers the hottest phones and accessories through Best Buy Mobile, and a complete line of technical support services via Geek Squad. 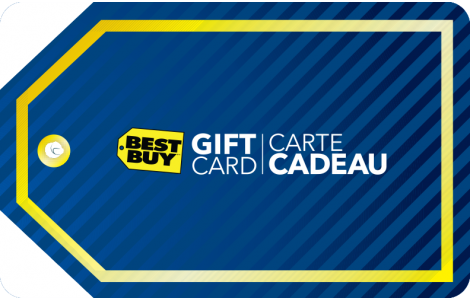 Best Buy gift cards do not expire and are accepted online at bestbuy.ca and in over 100 Best Buy and Best Buy Mobile stores across Canada. For more information, visit www.BestBuy.ca. This card is issued by Best Buy Canada Ltd.